Total Dalit population in Punjab – 32%. Total cultivable land with the panchayats across the state -168910 acres. 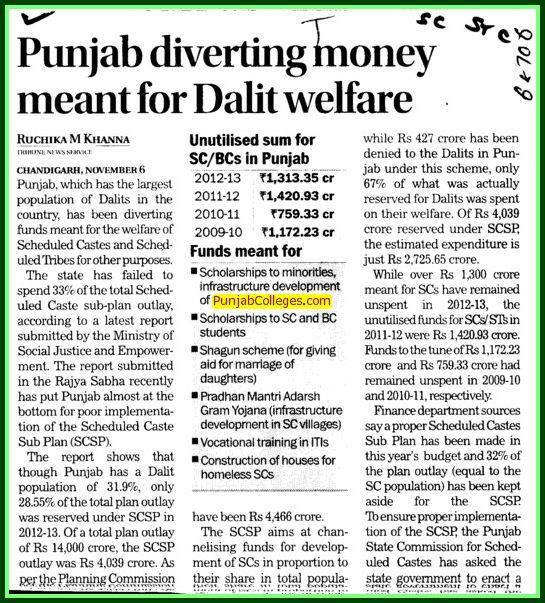 In reality, less than 4300 acres is given to Dalits in Punjab, i.e. around 2.54% only. Govt. deliberately keeps the auction price high so that Dalits don’t bid for it and if Dalits join hands and decide to put up a fight, they do face social boycott. Scheduled Castes workforce in the state during the SAD-BJP rule has decreased by 7,572 employees from 2007 to 2013. As per a government report, in 2007, the strength of SC employees in government departments was 73,557; in 2008 it increased marginally to 74,333. Since then, the graph is on the decline — 69,686 (2009), 71,539 (2010), 66,834 (2011) and 65,985 (2012, till March 31, 2013). It must also be remembered here that BJP and Akali Dal are ruling together in Punjab from last 10 years and in that period Punjab has drowned into drugs and alcohol. BTW, when RSS, VHP & BJP people have hijacked Punjab Govt. what else we can expect other than molestation, rapes & violence in Punjab? From TV channels to transport, in Punjab everything is under control of these people. Further, few years back Mr. Badal was busy installing cow memorials & cow commission. As if Holy cow is his mother and as if Sikhism worship cow! Badal is RSS agent. SIkhism was once one of the best religions in the world but people like Badal & Co have ruined it and they have polluted it to the extent that caste discrimination can be observed openly now. Lastly, Harsimrat Kaur Badal is a sister of drug king-pin – Majithia.